I once went through a phase where I didn't wear- or own- a single t-shirt. I felt like I was above them or something. This was during that weird time in American history when every girl aged 18-34 wore a D.A.R.E t-shirt ironically and owned some variation of the "_______ Girls Do It Better" ringer from Urban Outfitters. Remember Quinn Morgendorffer's pink baby-T? From undergarment to medium to socially pejorative lexeme, no other garment is as accessible, versatile, and hard-working as the t-shirt. While some clothing items identify and bind the wearer to a certain subculture, t-shirts are a democratizing blank canvas. Since their inception, t-shirts were a staple in every wardrobe, it seemed, except mine. For awhile I wasn't comfortable in t-shirts. On my first trip to Paris, I wore lace and silk blouses, high heels and ribbon-tied espadrilles (I didn't own any pants or sneakers, but that's a story for another post; no tank tops, either- thanks, abusive boyfriend from Voices Carry!). One night, I teetered down the steps of Le Pompon in a fancy dress and saw all the other girls wearing men's tees with skinny jeans, which they tucked into skirts for work the next morning. As soon as my feet touched American soil I ran to the thrift store and bought a J. Crew linen pocket tee, v-neck, olive green. Back then, t-shirts weren't too low-cut or sheer and didn't disintegrate after one wash. It was magic. No more tugging at button-downs, which always seemed to gape at the bust. Washed in the sink at night, it'd be dry the next morning, no ironing necessary. After five years of near-constant use- under jackets, over tulip skirts, with jeans and shorts and suits or tossed onto maxi dresses- it finally unraveled during an intense tug of war with Kar and Toffel when they climbed onto a closet shelf, later serving as a DIY cat tent. 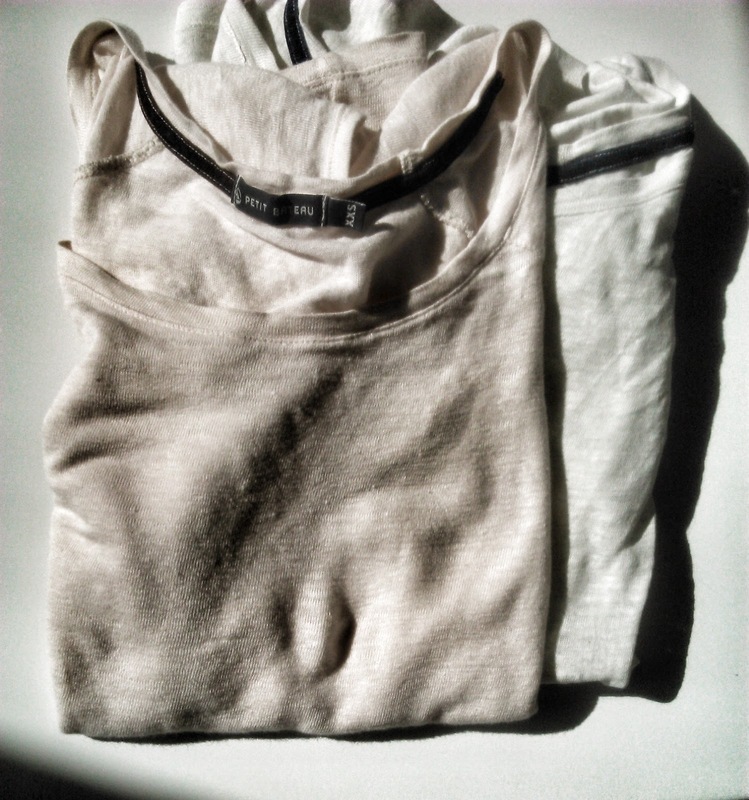 It took nearly a year to find a replacement- hip-skimming, opaque, soft- and two years to buy a second t-shirt. My husband literally forced me to buy them :) In the meantime, I made do with tops I already had. Sometimes people ask if I buy duplicates in case I can't find a particular item ever again. I don't- secondhand shopping precludes this. It's not the end of the world if I never wear another linen tee. I certainly don't mind holding out for a good one. 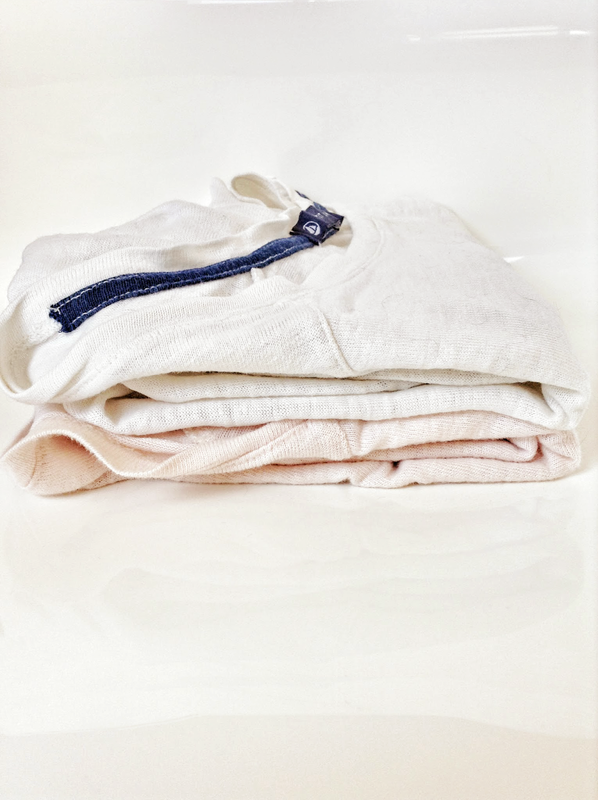 Although I consider most of my clothes "staples," the linen t-shirt is a seasonless workhorse. To paraphrase Caroline de Maigret, it's like cashmere. It makes me looks like I have a neck. The slub jersey feels luxuriously cozy in winter, fresh and effortless in the summer. I like the way it slides on my shoulders and the way the subtle hue brightens my complexion. Worn with my skirt or jeans, under a cardigan and over a dress, it adds variation to a simple and minimal wardrobe. Why linen? Until that tapenade-colored J. Crew t-shirt, most of my things were made by young girls in India or China earning only a few cents a day. Cotton came from the US, China, or Uzbekistan, the looming shadow of slavery casting a pall over any usefulness. Hundreds- maybe thousands- of gallons of water went into the lint, not to mention pounds of fertilizers. Cultivation is no picnic for even US laborers; after braving wind, pests, storms, and volatile international markets, farmers painstakingly harvest the bolls before sending them to ginning mills, where workers inhale hazardous particulates. The fabric takes several gas-guzzling trips and chemical-laden baths before settling into a closet. What did Karl Marx say about cotton? "Without cotton, you have no modern industry." Petit Bateau production methods may be grim, but linen cultivation requires less energy inputs, and buying secondhand is even more rewarding. Most of the women I see in my neighborhood walk around in tunics, loose-fitting blouses, drapey knits, and sharply tailored button-downs. As for t-shirts, generally speaking, curvy Parisians wear scoop or v-necks, Jean Seberg-types prefer jewel and boat necks, and neck-skimming tees look wonderful on broad shoulders. I like open necklines- I don't know my "body type," though I was recently compared to a wonton by a barber with a face tattoo in Amsterdam. Anyway, this isn't a fashion blog, but I thought I would share the rationale behind every item in my closet (it won't take long, there's not many). The nice thing about not having a lot of clothes is that every object represents something, a story or memory or event, something I won't forget. What an irony. I abandoned tshirt for button-ups just for the tugging and gapes at the bust. I feel i am above tshirts and they are too little boy-ish. Although i don't mind wearing them with a skirt. I like your taken on linen. And sweatshop labour. It makes me happy that more people are talking about the supply chain. Those tshirts do look delicious. Thanks Archana! I used to feel much the same I think. T-shirts always seemed to make me look pregnant. Linen makes a big difference, it drapes better somehow, and I suppose I feel like a button-up looks too severe on me now, perhaps because of the casual way Parisians dress... although all the women look great in those relaxed silk button-downs! I know it's not a fashion blog, but I do love the wardrobe posts :) It's interesting to hear your logic. Went to BR this past Sunday to look at their linen T (honestly, unsure of their supply chain ethics.) Alas, it was utterly sheer. Waiting for a linen T that's thick enough AND a V neck. Fear I may wait forever. Ah well, first world problem. Yes! Why are they all so sheer? Thank you for sharing this Darcy! I remember seeing the kickstarter for Andrew Morgan but did not see the actual movie. I'll have to watch it now. I think so many people think they are supporting the economy, other people, the government etc with positive purchasing power. It's perceived as patriotic and helpful when it couldn't be further from the truth! Oh cool, I should have done Dressember (sorry published before I typed this part). It's basically what I did haha... it was too hot for pants or separates!! Can you explain more about the "positive" purchasing power issue? I just read a book about this very topic and I'm trying to get my mind around it. Do you mean that people think they are helping others by buying, but that they don't realize it is at the expense of many other human beings/environment, etc.? Hi, what book did you read? I honestly haven't researched it too thoroughly so I'd be interested to read it as well. Yeah, in marketing class (101, years ago now) I remember the professor saying marketers like to deceive people into thinking they are helping the environment or being a good patriot by buying. 9/11 was one key example, where marketers capitalized on nationalistic fervor and collective grief to increase consumer spending. According to the National Bureau of Economic Research’s Business Cycle Dating Committee, consumer confidence declined in the months leading up to the terrorist attacks, but personal and household spending increased rapidly in the months thereafter. According to Bloomberg, consumption surged that October. Greenwashing is another example. 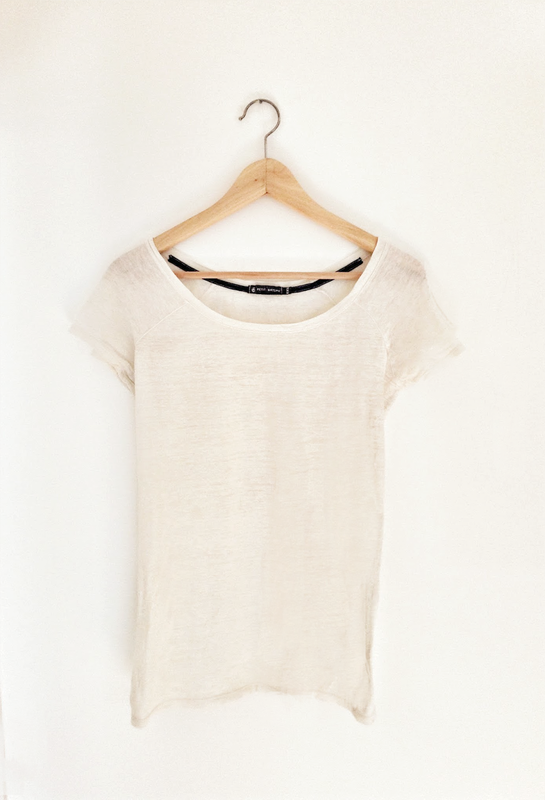 People think they're doing a good thing in buying bioplastics and bamboo clothing. They think quinoa is great for both their health and the planet, when really a whole host of issues- the breakdown of social relations, heavy environmental toll- can be associated with it. I'm probably using the wrong terminology when I say positive purchasing power, so I'd love to hear your thoughts! P.S. Livia Firth, featured in this preview, is the lucky wife of Colin Firth. Oh, Ariana, I'm so sorry that someone was unkind to you and compared your body to a wonton, but the way you told that story made me giggle! :) I'm partial to merino wool t-shirts, but I'm going to keep my eye open for linen next time I need one. Haha thanks Kristy, I think like looking like a wonton! :) I didn't know merino wool t-shirts existed! There are so many traceable merino wools out there right now and of course wool is one of my favorite seasonless fabrics and so durable, I would love to see a t-shirt made of that fabric. Do you have any recommendations for readers? Thanks! I can recommend Icebreaker, made in New Zealand from merino wool. Amazing company, amazing products. When you buy something, it has a code so you can trace the wool back to the farm it came from. They started with great travel clothes and are now branching out more and more into everyday wear. Thank you Angela, what a responsible way to be transparent about the supply chain. I just read their Ethics section on the website. Great philosophy and great way to do business! Thanks for the recommendation. I second the Icebreaker recommendation! Best quality I have found and as you've mentioned, seems like a great company. Their wool is very fine and soft, I have super sensitive skin and I've only had one or two of their garments irritate my skin. Some days I wear Icebreaker from head to toe :). There is a discount website - SierraTradingPost.com - where I've purchased most of my Icebreaker stuff at really good prices. Good morning. Love the updated photos for the coats as well as the ideas for the links to your other "basics" posts. Quick question- did you mean for the lingerie link to take us to this post? :) The links are great- I find myself sometimes struggling to locate a previously read/ loved post so this is great. Am I missing a search feature somewhere? Thanks!!! Hi Darcy! I didn't mean for that, thank you for letting me know! The link is updated now. There is a search box at the side of the page under Archives. I get the question often so I think I need to move it because sometimes I miss it myself ! Oh hurray! Thank you! Yes, I've looked and missed it many times. Maybe at the top of the page. I don't understand these things but either way, so glad to know about that now!